This recipe came about because my daughter was poorly so I couldn’t leave the house to buy supplies. Having been inspired to make foamy dough, I had already got the cornflour of the cupboard. It’s the kind of thing that’s always lurking at the back, rarely used. I thought the foamy dough would be soothing for Boo who was feeling really sorry for herself and full of cold. I was certain that we had shaving foam in the back of the cupboard. My husband has a gigantic beard but occasionally gets shaving foam for Christmas so there is usually some lurking there. But not today. I had clearly had a clear out and finally got rid of it. Doh! Anyway, moisturiser seemed as good an idea as any and it had the bonus of smelling lovely. I didn’t want to make too much in case it went wrong so just added equal parts of cornflour and moisturiser. Top tip: don’t add all your ingredients at once. Your mixture might need a little adjustment if it’s too wet or too dry so always keep back a little to add at the end. I played around with the quantities a little but basically equal measures made a lovely smooth putty. As you play with it, it becomes more stretchy and moldable. 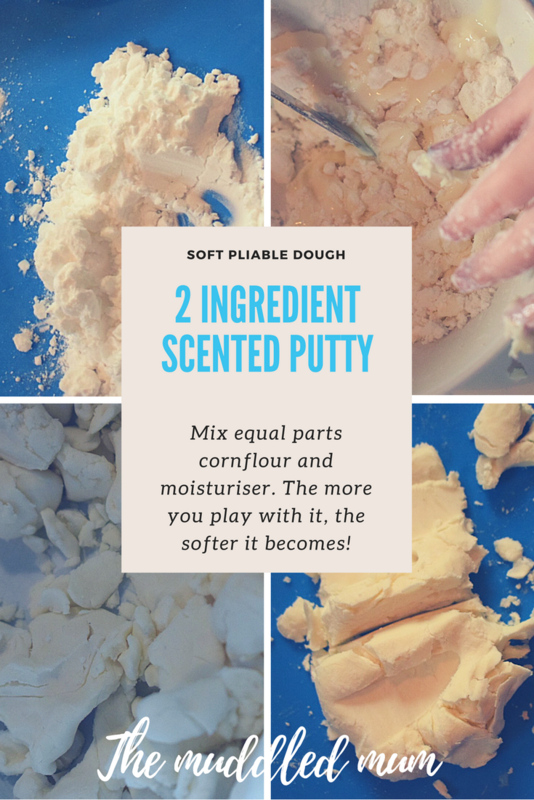 You can pull it apart like slime or mould it like play dough. Once I got the ratios right, it wasn’t sticky. It’s actually silky smooth. Seriously, I cannot get enough of this stuff. It feels so good to play with. My daughter loved it too – it happily distracted her from feeling poorly for a good 30 minutes. She then came back to it lots of times tbroughout the day. Just make sure you wash hands well after you’ve used it. The moisturiser will leave a residue so a soapy wash is needed when you are finished. This recipe is so simple! It took less than 5 minutes to make using ingredients from the cupboard. I hope you enjoy it! Next Choosing a Halloween outfit that can be re-purposed for winter wear.